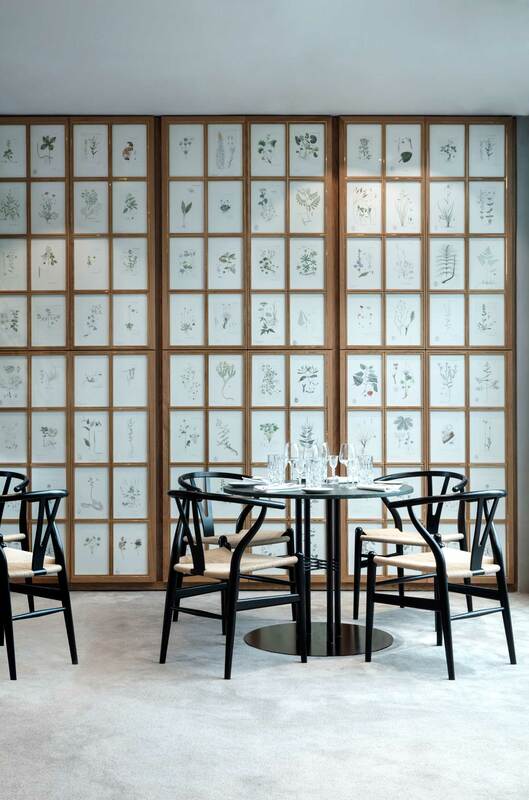 Flora Danica & Copenhague Restaurants Inside Maison du Danemark Paris by GamFratesi. 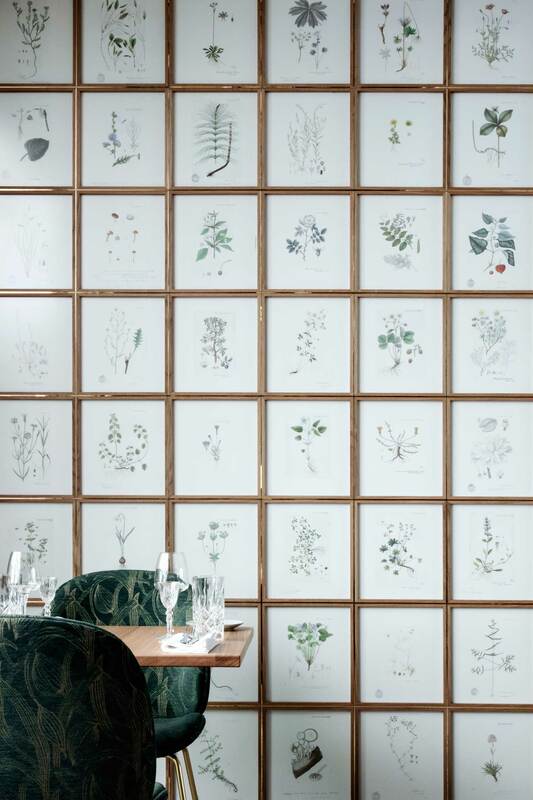 Flora Danica Restaurant at Maison du Danemark Paris. Photography by . A stone’s throw from the Arc de Triomphe on Paris’ incomparable Avenue des Champs-Élysées is , a cultural institute opened in 1955 that promotes Danish arts and culture within Paris. 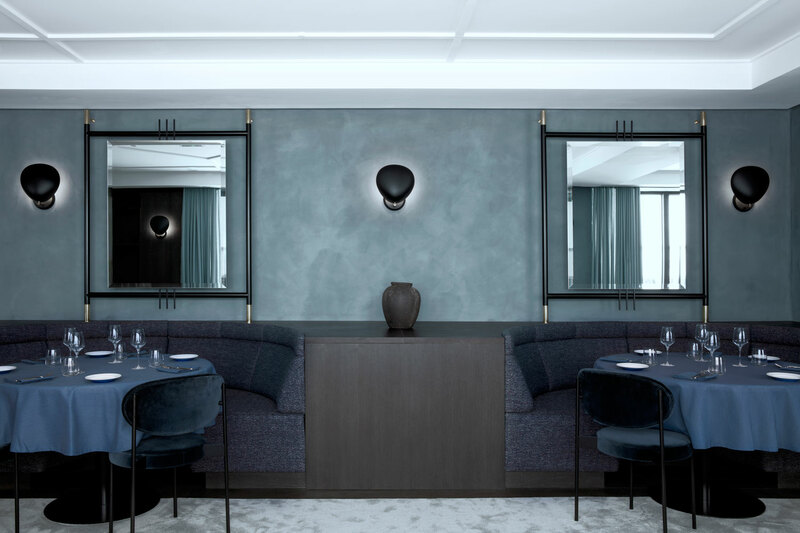 Originally built in 1935, the historical building was in need of a makeover and the Danish-Italian design duo GamFratesi won the tender to renovate the prestigious interiors. 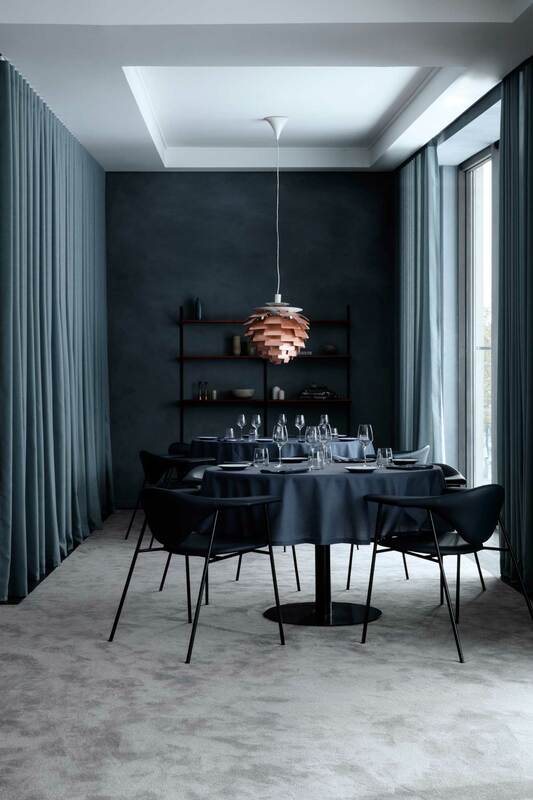 In what was one of their biggest projects to date, GamFratesi embraced a number of Danish brands and their iconic products, such as Louis Poulsen, Lightyears, Gubi, Carl Hansen, Brdr. 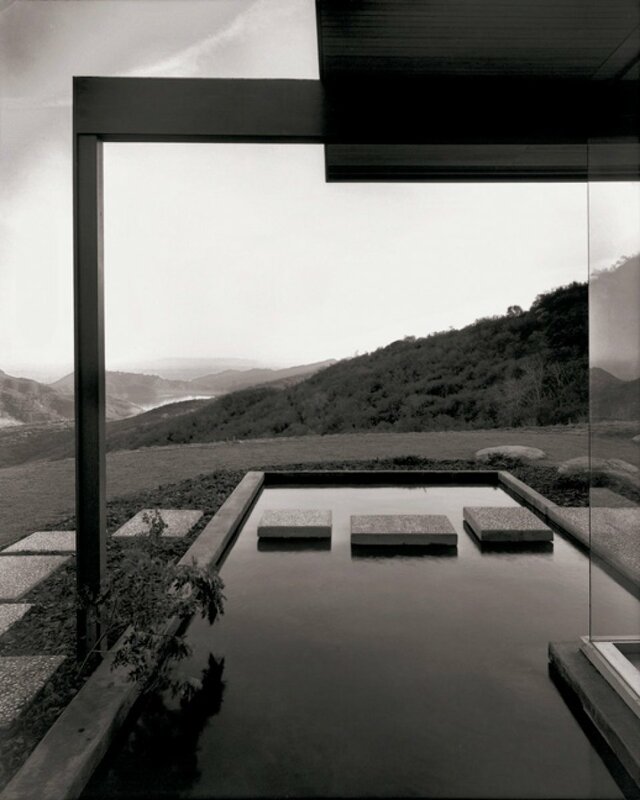 Petersens, expressing a combination of contemporary and classic Danish design and philosophy. 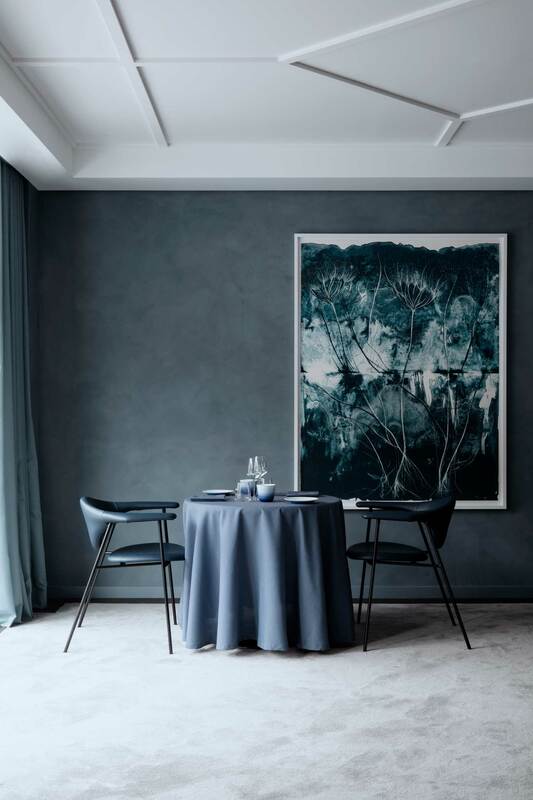 Stine Gam and Enrico Fratesi‘s involvement extended from the general interior, all the way through to furniture and tableware selections, having designed a special series for Royal Copenhagen, combined with some tableware from Frama. 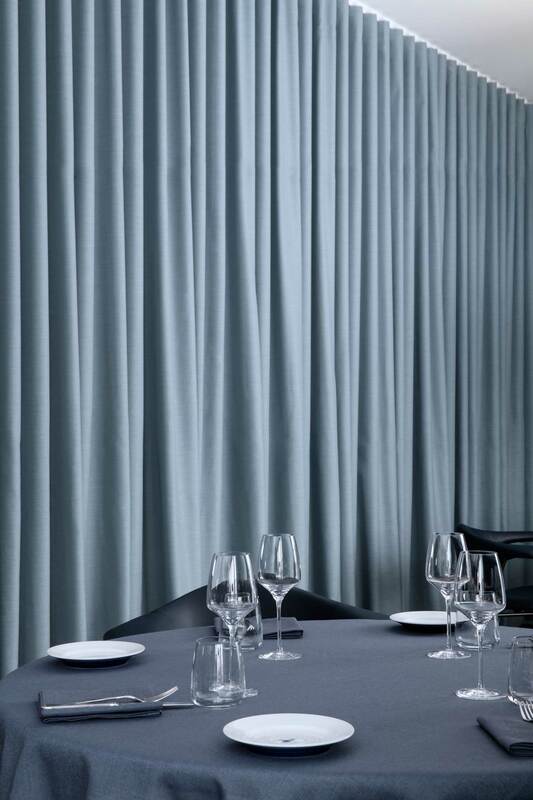 Well considered and rich with colour and texture, the fit out oozes elegance and is, in my opinion, total perfection! The two restaurants – and – are both housed within La Maison Du Danemark, communicating two different personalities and fusing elements of the past and present. 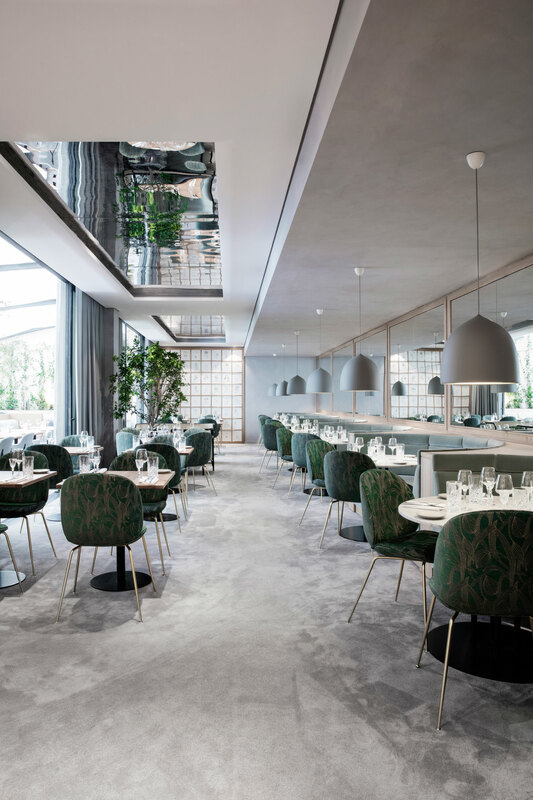 is a contemporary brasserie headed by Chef Guillaume Leray that celebrates Danish cuisine with sophisticated French touches. 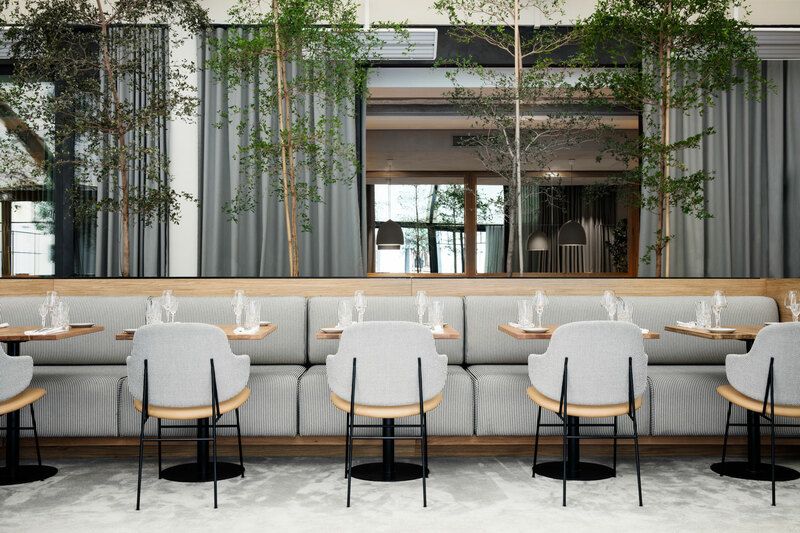 Located on the ground floor and courtyard of La Maison du Danemark, the space offers an abundance of natural light and evokes a strong connection with nature. 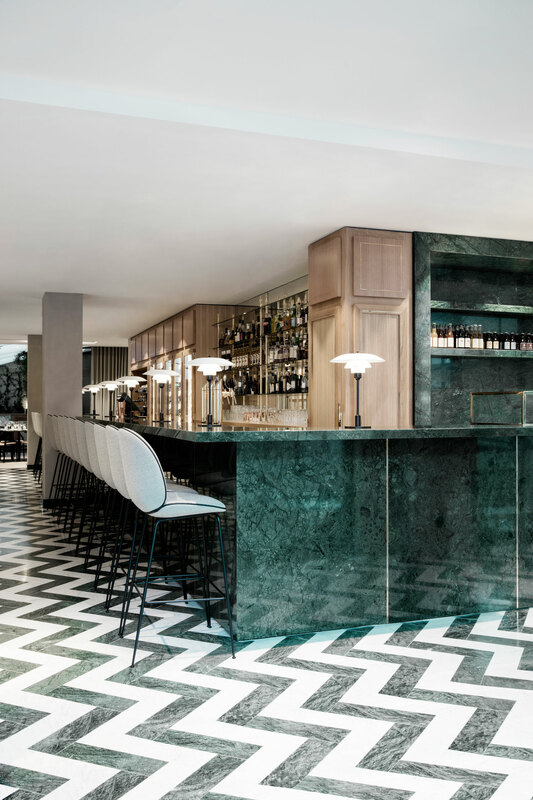 Awash with the rich tones of green, the space is comprised of Herringbone marble floors (both Carrara and green), an expansive marble bar, lush plants and a large wall display of traditional Flora Danica drawings. 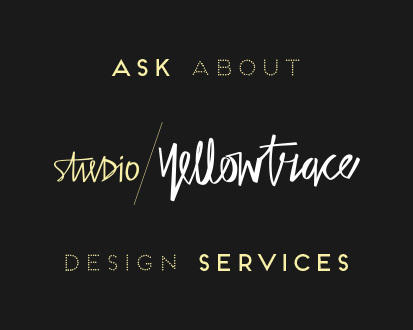 This palette is offset by shades of grey as well as black and brass detailing. 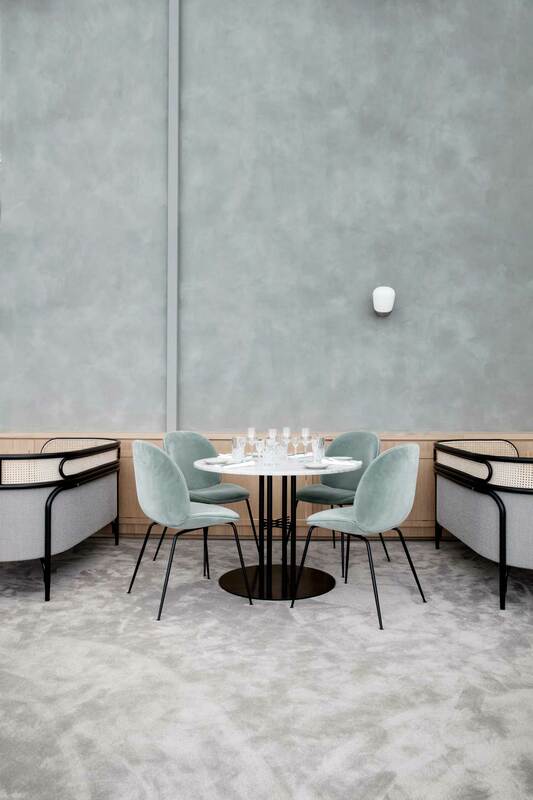 Representing Nordic and Art Deco influences, GamFratesi collaborated with Danish design house Gubi to design develop new products including the TS Dining Table. The new furniture will be a part of Gubi’s permanent collection and will be launched at the 2017 Stockholm Furniture Fair. See more projects by GamFratesi on Yellowtrace. Copenhague Restaurant at Maison du Danemark Paris. Photography by . 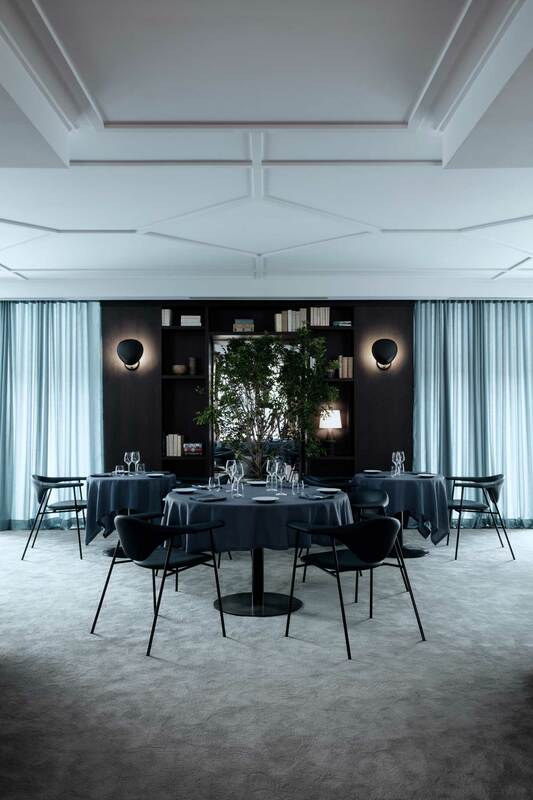 Located on the first floor of La Maison du Danemark is , a more formal restaurant where Chef Andreas Møller prepares unique Scandinavian specialties. 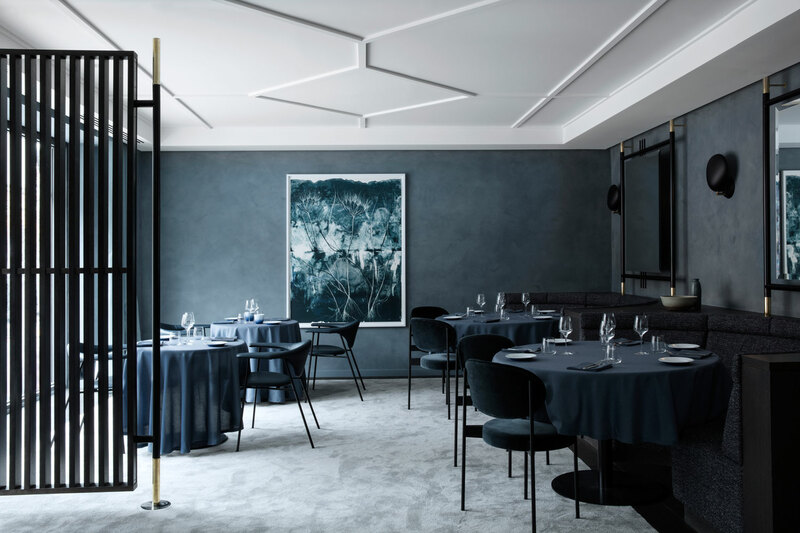 Now one of the most popular restaurants in Paris, Copenhague offers creative cuisine, spectacular views and a fit-out that’s to die for! 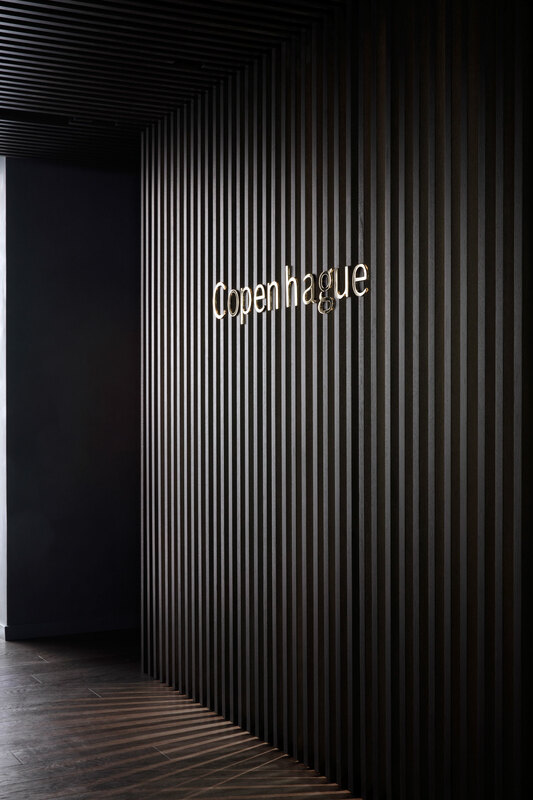 Unlike Flora Danica, Copenhague is draped in darker, more intense colours and textures. 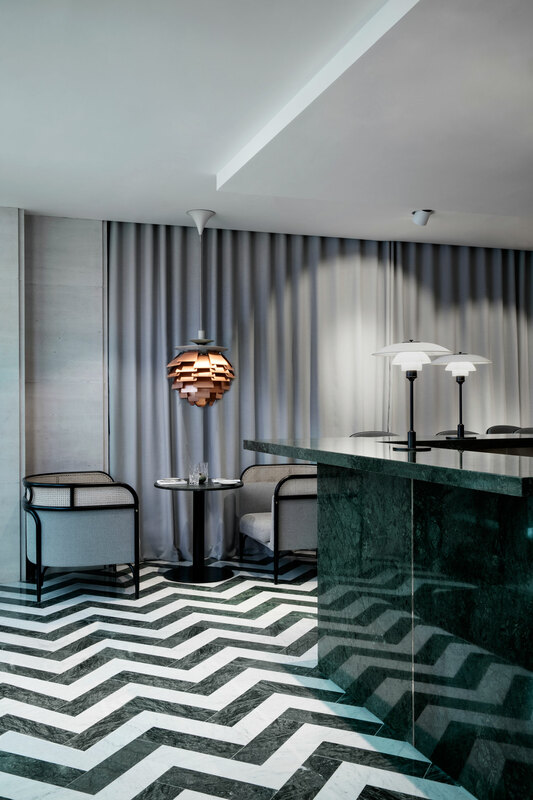 The walls are lined with Gubi’s Cobra Lamps while the large-scale mirrors are based on the same design concept as their TS Collection. It’s clear that our favourites GamFratesi have done it again. With their dual traditional background, Stine Gam and Enrico Fratesi have created furniture and spaces that respectfully reflect tradition while also emphasise unique stories, symbols and associations. The newly renovated interior at La Maison du Danemark combines a wonderful fusion of modern Danish elegance with a refined French influence. C’est magnifique! ‘Reconfiguration Of A Tree’ Research Project by Thomas Vailly. 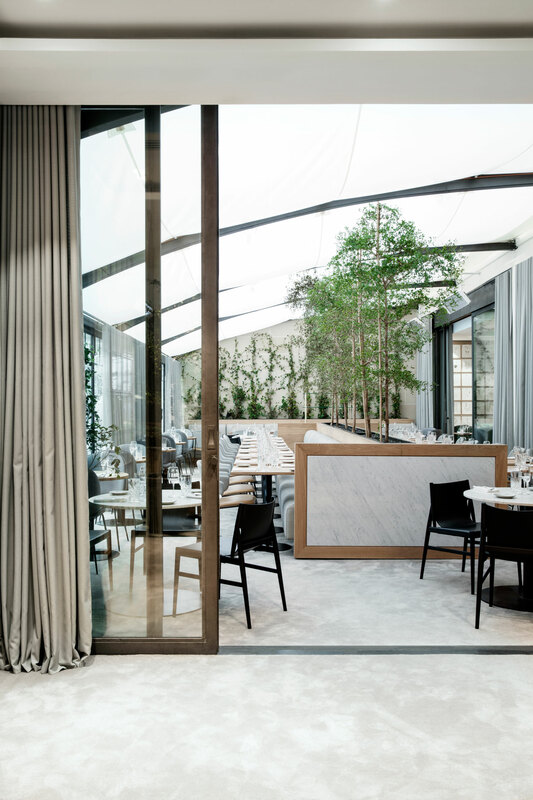 Liberamensa Restaurant by Marcante-Testa Located Inside the Turin Prison. As beautiful as it may look, and it does, it just looks like just another Hotel/Bar and not something that Denmark is famous for and what makes it stand out from the crowd. Looks like the Architect didn’t have free hands.